Think shortstop is the sad position it used to be? Not by a long shot, says our Scott White. Remember back when the shortstop position was basically Troy Tulowitzki and then everyone else? It was about relative productivity. He represented such a step up from most everyone else at the position that seizing him in Round 1, maybe a round earlier than the pure numbers said he should go, became a top priority for many on Draft Day. imagine it: a shortstop who could hit like a first baseman. The change has been an abrupt one — so abrupt that many longtime owners may not have fully recalibrated their thinking. "Sure, shortstop is getting deeper, but it's still not a bad idea to fill it early, right?" Here's the thing: That gradual change we were all noticing just shifted into overdrive. Between Manny Machado and Alex Bregman securing eligibility there and Javier Baez and Trevor Story taking an unexpected leap forward, the crop of elite-level hitters at the position has basically doubled. And the most fascinating shortstop of all, Adalberto Mondesi, wasn't even on the mixed-league radar until late last season. Throw in Corey Seager returning from Tommy John surgery, Gleyber Torres making a successful debut and Jurickson Profar rounding into form, and you could make the case shortstop is the deepest of any position except for maybe third base. The top was crippled somewhat with the news Francisco Lindor might miss the start of the season due to a calf injury. He helped raise expectations for what a shortstop could do with a near 40-homer, 25-steal season a year ago. The home runs continued an upward power trajectory that most of us presumed was too good to be true heading into last year. The steals might be a littler harder to come, especially given the state of his legs, but he's still a borderline first-round pick. He's not the only shortstop who'll go in Round 1 either. Bregman belongs there, particularly in points leagues that offer direct rewards for his stellar strikeout-to-walk ratio, and Trea Turner at least does in Rotisserie, where he remains probably the safest bet of any player for a big stolen base total. Each is so optimized for his strongest format that there comes a point near the end of the first round when you're pretty much forced to take whichever even though doing so could present a headache later on. That's because the next seven at the position all offer high-end potential, and chances are one, if not more, will fall in your lap at a time there's no other logical selection, putting you in position where you're either passing up a quality bat at shortstop or drafting it for a utility spot. It's a little easier in a Rotisserie league, where you have an extra middle infield spot to play with, but even there, you may find yourself regretting a pick as in-the-moment obvious as Machado in Round 2. You've heard me say position scarcity is making a comeback? Partly it's because of shortstop's move to the opposite end of the spectrum. You may be better off picking Paul Goldschmidt than Machado in that spot. The tricky part is that the surplus is mostly true for shallower leagues. The position takes a turn for the worse after the top 14 or so — four of which are also eligible at some other position — and you don't want to risk being the only owner without a big bat there. It's why I'm not especially inclined to wait until the last of Seager, Xander Bogaerts or Carlos Correa, himself not far removed from first-round consideration, goes off the board, which sometimes can happen as late as Round 7. It's great if it works out that way. Chances are you'll be drafting from a lower tier at most every other position by that point. But if you find yourself eyeing, say, Story in Round 3 ... I mean, you can't expect to do much better than that. Precisely because there are so many productive shortstop bats, you need to make sure you secure one. The penalty for going without is too great. One that I would specifically target, though, at least in a Rotisserie league, is Mondesi — and probably by the middle of Round 3. You won't have to pay quite the premium for him that you will Turner, and the expected output isn't far off. He's not as safe overall, but in terms of stealing bases, he probably is, and the opportunities to draft someone who'll carry you in the category while still contributing in other areas are pretty limited once he's off the board. Garrett Hampson. The big hurdle is him winning a starting job (most likely at second base), but if he does, he's a prolific base-stealer who'll enjoy all the benefits of Coors Field's BABIP-inflating tendencies. Jean Segura. 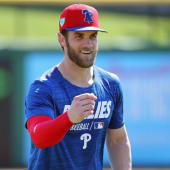 He no longer stands out at a position full of studs, and while the move to Philadelphia might help him regain some lost pop, it could come at the expense of stolen bases, given manager Gabe Kapler's tendencies. Paul DeJong. He has a 162-game pace of 32 HR, 90 runs, 97 RBI, and this is the best offense he's been in. Marwin Gonzalez. It seems increasingly unlikely he's starting every day, and 2017's power is now a clear outlier.